Its here!! You wished for it and now its finally here. The ultimate in beautiful, wearable art and wrapping qualities. From squish to Toddler with no effort at all. Even at a gsm of 306, requires little to no breaking in and will reward that total lack of effort with smoothy soft, texture and glidey erfection. Sounds good right? It is. available in sizes Regular and large, hybrid or gathered shoulder. The striking colour of Coral Bay Chrysteal will make you want to swim in its Egyptian cotton shimmer. 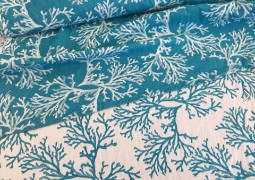 Teal cotton on and Ecru Egyptian cotton warp weighing in at 290 GSM post wash.
Coral Bay feels light and silky in hand but has beautiful texture from the Coral making this the ultimate summer wrap without compromising on solid support. Passes glide then hold in place. Suitable from newborn to toddler and beyond. 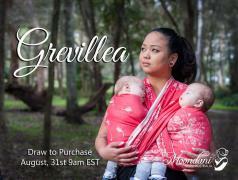 Ring slings will also be available. Onbuhimo and Full buckle carriers available for pre-order while stocks last. Strictly limited edition. Weighing in at a post wash GSM of 306. 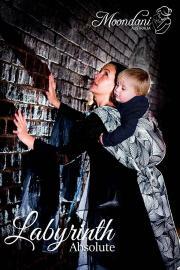 This 100% cotton wrap is the “oubliette” or Toddler prison of wraps! Black weft upon an Ecru warp and texture for days created by the intricate and mesmerising pattern reminiscent of the twists and turns of a magical Labyrinth. You would expect a wrap that boasts such support and grip would be a beast at the start.. Far from it! Soft from the first wash and quickly conforms to a cloud like comfort on your shoulders, this wrap is perfection! Suitable from newborn to toddler and everything in between. Shines in a short size yet has enough glide to manage double layer passes easily. Draw to purchase opens Wednesday, 20th July and will be open for 24 hours. Ring slings will also be available. Onbuhimo and Full buckle carriers available for pre-order while stocks last. They will be an option on the form but will be made to order. Strictly limited edition, don’t miss this baby! The Flower that inspired this wrap is a powerhouse to say the least! When you see a Waratah in bloom it is awe inspiring and stops you in your tracks...And so will the Moondani Waratah design. Woven with a rich, lustrous red tencel weft set against a black warp that just feels like luxury to touch, luxury to wear and a joy to wrap with. Weighing in at 285 GSM and soft in loom state but dont let that fool you, the wrapping strength of this blend is something to behold. Newborn to toddler and beyond, tencel has a strength greater than that of linen yet a soft silkiness that puts you straight at ease. Using 100% natural fibres, you will find Waratah has the breathability to be worn in comfort year round even in a hotter climate. Jimulu Twilight- Anniversary Edition Pre-order! Where Moondani began -The iconic design that has now become Moondani 's Signature. Our new take on Jimulu, Twilight features a five colour graduated weft on an ecru warp to set off the Australian Boab tree silhouette. One of our lightest wraps in hand, Twilight is designed for our hot Aussie Summers. The combination of cotton and Egyptian cotton brings a balance of strength, Support and softness using these luxurious breathable natural fibres. 100% Cotton woven jacquard wrap. This design features the Australian boab tree silhouette against a colourful graduated sunset. Weighing in at 306gsm after the first wash, Jimulu is suitable for newborns to toddlers. It is soft after its first wash (It is always recommended to wash your wrap before wearing as this helps to set the fibres and also softens the wrap) and will continue to get beautifully soft and floppy. 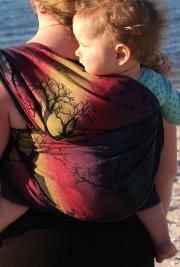 It is easy to wrap with and provides comfortable support. Suitable for those who are new to woven wraps or more experienced wearers. Ring slings will also be available. Onbuhimo and Full buckle carriers available as a custom slot for pre-order while stocks last. Strictly limited edition. 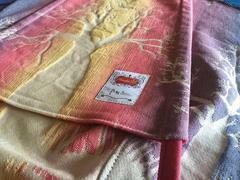 From the Essences collection, comes this spectacular boutique wrap. Pink Grevillea is the Australian bush flower that inspired this design. The essence of the Grevillea embodies unity. Unity of mind, body and spirit and the freedom that comes when you can truly be yourself. Oozing sophistication, this coral pink wrap can be worn weft side out when you feel like embracing your colourful side, or paired back to a more subtle ecru warp side out with pops of colour. Either way this wrap design is floaty and elegant. Luxurious Egyptian cotton is known for its soft feel and subtle sheen, paired with the cushy comfort of merino wool, these fibres offer breathable comfort in all seasons. best of all, the wrapping qualities of Grevillea will amaze you and it requires no breaking in! From the tiniest bub to a weighty toddler, this wrap shines in both a shorty and a longer wrap and will allow you to carry your child effortlessly. Truly cloud like support without feeling weighty or thick. 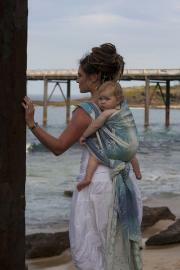 The perfect wrap for the warmer months when you need the support but don't want the bulk. Light, cool and comfortable. Jewel weighs in at 255gsm in loom state and fluffs up nicely after the first wash to be cushy soft. Easily accommodates a newborn to a toddler and shines in a multi layer carry for heavier bubs. Similar to Moondani's signature Jimulu range, Jewel wraps easily and requires very little breaking in, making it suitable for those new to wrapping. 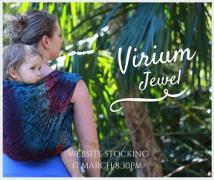 Virium Jewel will be available in size 2-7 and ring sling options. 100% cotton, weighing in at 255 gsm loom state, storm feels like a lighter weight wrap in hand but when you put it on it feels cushy, solid and supportive. Taking little to no breaking in beyond its first wash and steam iron, it is a great wrap for beginners to advanced wrappers and everyone in between. The watery colours of the grad set the perfect stormy background for the ecru Boab trees. The trees emboss after washing the wrap giving it a subtle touch of grip... the perfect amount to hold your wrap job firmly in place. See the reviews page for reviews! 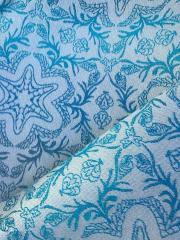 100% Cotton Loom state 280 GSM. Beautiful soft colours of Mauves and blues. Such a special design, close to my heart. A blend of three flowers which have special energy for the bond between mother and child. Pink flannel flower is the heart essence and is all about finding joy in life and being aware of and grateful for the little blessings in life. Fringed violet or fringed lily is for protection from negative energies and can help to heal after a shock to the system. Angelsword - helps you to free yourself from outside influences and connect with your intuition. To me motherhood and baby wearing is ALL about using your intuition! 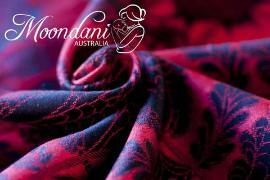 Moondani is an entirely Australian owned and based company bringing you quality Jacquard Woven Baby wraps, carriers and slings. We also have occasional stockings of special items such as homewares and jewellery. All products are designed in house using the finest available materials to bring you high quality items. We pride ourselves on delivering exceptional customer service. Moondani products are designed by me, Peta Wilson, a baby wearing mum of two. An experienced baby wearer and active member of the baby wearing community, I was drawn to the idea of creating woven baby wraps as soon as I set eyes on them! My artistic passions run deep - from sewing and textile design to oil painting, photography, digital art, dance and music! I have always searched for a way to combine all of my loves, including my family. I am also a physiotherapist, and have an understanding of the ergonomics of baby wearing and am dedicated to delivering baby wearing products that are safe, supportive and comfortable as well as beautiful! I love to connect with people! Find Moondani on Facebook and instagram. 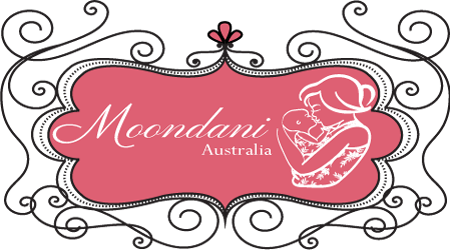 There is also a chatter group called the Moondani Yarn, which is a place to chat about all things Moondani and baby wearing.